Nothing beats an invitation to 700 private acres planted to attract migrating doves. But what if it's raining almost the whole day? There's a fair amount of waiting involved. The damp sky is keeping the doves from moving. This hunter stands up from his seat-bucket to stretch his legs and make sure his over-under is ready for a flyover. A hunter - his classic Parker side-by-side across his lap - and his 3-year-old Drathaar (or, German Wirehaired Pointer) waits at his dove station. 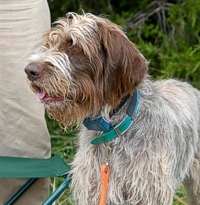 The air is steamy and drizzly, and the Wirehair is showing great patience for a young pointing dog. 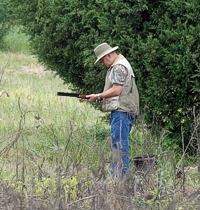 Well, that 19th-century Parker works, its owner can squarely hit a high-speed dove, and his joyous Wirehair was happy to go find it in the damp sunflower patch. Good girl! Let's get those dove feathers out your mouth. Ready for another dove to wander by. During a weather-induced lull, a hunter lets his Vizsla and his Springer move gently about the grounds so they don't become too restless. They're a close-working, friendly pair. Turns out there is a little critter-scent in the cover, even on a damp day. A bit of heavier weather is moving in, and a pair of hunters walk their gear out of the field. The doves won't move much in steady rain. At the left of image is one of the huntmaster's station stakes: the field is dotted with them to indicate approved shooting positions. That $100 canopy is suddenly looking like the best purchase of the season. The dog crates in the back of the SUV, the hunting party, the dove stools, guns, jackets - it all gets to dry out a bit as the weather passes through.